We don’t see and hear ourselves when we are angry, especially when dealing with our kids. We shout, scream, and say things that are considered very mean in an adult world. It’s true that we are tired beyond belief, enraged, and torn apart, but kids only exhaust us because they are so full of energy themselves. Hence, we are unable to keep up. I don’t realize the intensity of my behavior until I see someone else doing the same, and immediately I find myself in them. I realize the severity of my rage when I hear mothers shouting at the tops of their voices. I can hear them despite the fact that we don’t share the same house and sometimes are not even immediate neighbors. Alhamdulillah! He notifies us before we could think bad about others or before we even try to implant that mustard seed of arrogance in our hearts. What a mercy of Allah! Indeed, He is The Ever-Watching and The Wise! 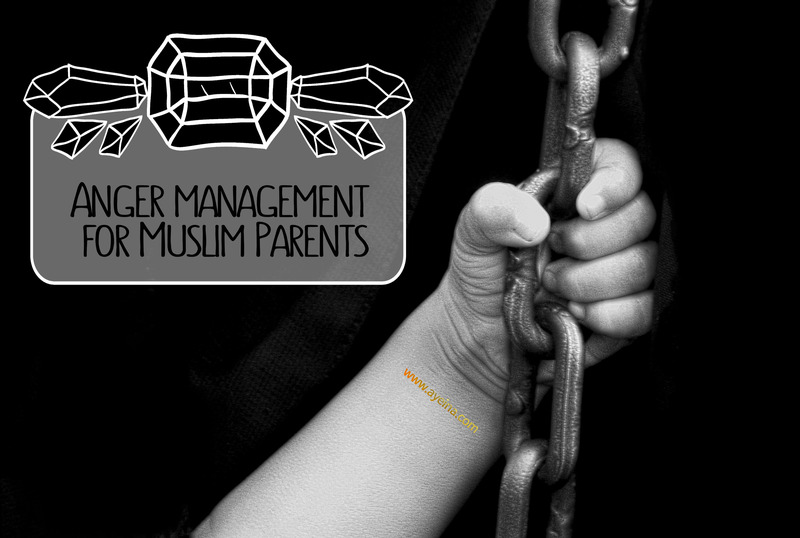 Controlling parental anger is hard when deep down inside you feel like you own these children because they are yours – because you gave birth to them. You see, we don’t even own ourselves, let alone our kids. We all are Allah’s amaanah and so are they! Kids are hardly responsible for our meltdown – they simply tend to pay a price for what we are unable to handle within ourselves. If you expect kids to act like adults, you’ll be disappointed over and over. Think of it like – Allah gave you His creation so you can beautify it and return it to Him when the time comes. So are you going to return His amaanah in a damaged form? Kids see, kids do! Imagine how would you feel seeing your kid doing the same? It is the best way to realize our mistakes. The only way to become the patient, calm parent you want to be is to “parent” yourself compassionately. That means learning to coach ourselves lovingly through our own emotions, so we don’t take them out on our children. If you find that you are constantly annoyed even when kids talk to you normally (they aren’t throwing tantrums or anything), it means that you are exhausted beyond your capacity. It’s a signal that you need some time off or it’s time to let someone help you out (be it a spouse/ a nanny/ a relative/ a babysitter etc.). If you can’t afford help and you have no community around you, it’s time to cut off unnecessary things in your life that you are trying to catch up on and getting frustrated as a result of failure in doing everything (and then blaming the kids as a coping mechanism). You can let go of keeping the house clean 24/7 (and then declutter as much as you can later on – when you have the energy – the less you have, the less overwhelmed you’ll feel in shaa Allah). You can take a nap while putting the kids somewhere safe or simply even lie down (you may wake up to a hurricane – been there done that – but when you are well rested, you’ll be able to face the challenges that comes with parenthood much easily in shaa Allah). You can cut down on your own media consumption – social media/ TV dramas/ Movies – whatever it is that takes your free time away from you. You can make simple meals and let kids have raw veggies or fruits at lunch time etc. (they will grow up just fine with simple food too. But with emotional damage that your anger can leave on them day in and day out, can have a lifetime effect). If you think that your severe exhaustion doesn’t go away even with rest, then it’s time to see whether you have any medical condition that’s contributing to your exhaustion – it could be anemia, depression, hypothyroidism etc. Please note that sometimes physical pain can lead to mental exertion (and vice versa) so if there is no said medical condition, then it’s time to change your health lifestyle. Turn away from your child physically. Take a deep breath. Try to shift your attention from your child to your inner state. Under your anger is fear, and sadness, and disappointment. Let all that well up, and just breathe. Let the tears come if you need to. Be kind to yourself. Once you let yourself feel what’s under the anger–without taking action–the anger will begin to melt away. If you’re unable to figure out what’s the reason behind your constant anger, try journaling for better self awareness. Try sunnah like – seeking refuge with Allah from satan, sitting down if standing and lying down if sitting, being silent etc. Do we have the capacity to be patient more than 5475 times over a simple matter? Do we teach with love? Is our frustration more important than the value and command of Allah? May Allah make us those He loves – The patient ones. Needed to read this today! It’s so easy to get angry and end up shouting but children are here for us to take care of and we should not raise our voices. Yes it can be hard if you are overworked and get no help from your husband, but then that is our test…..and if we end up screaming and shouting we are pretty much failing. Yes, all us ladies gotta work on this! Its very very hard but worth it! This is such an excellent reminder. It’s so so easy to end up losing your cool completely and when you reflect on it later – shouting is completely pointless as all they learn is to communicate that way in return! Subhanallah, you are sooo right. It’s easy to let our emotions overcome us and drive us into thinking the young ones under our care belong to us – to control and manipulate as we wish. While we all belong to Allah and they are only an Amanah. And this issue is relevant to parents, educators and other adult carers. As shepherds and the best example for the young ones, we need to learn the Seerah and take our example from the prophet as he dealt with children. The most important thing to remember is that they will ultimately learn from the adults from their lives. So let’s make it a worthy example. jazakAllah for the reminder which is always in need. opting for shouting and corporal punishment should be taken as a failure on the part of the mother but sometimes is the only last resort. well, we should make every effort to pray,to ask ALLAH(SWT) for the guidance to be a winning mother.